Years ago I had an agent for Dead Lies. He liked the first draft, told me, “You’ve really got something here.” That was over drinks. After doing the rewrites he suggested and meeting again in a bar, I realized he wasn’t so much interested in my book as he was in hitting on me. Yuck! Boy, was I green. And hopeful. I sent the agent on his way and continued working on the book, polishing it and perfecting it, even as I began writing another one, this time with a co-author. We eventually found a big-time agent for Abigail’s Kiss (as yet to be published), a sweet story about a young man raising a child with Down Syndrome that is based on a Buddhist concept that people with Down’s are reincarnated enlightened beings. She loved our book, thought it was a bestseller, but then couldn’t sell it. Seriously, we were rejected by at least thirty publishers. I respected our agent; she was truly dedicated and a pro. But the year it took to finally land our book dead in the water was exhausting and demoralizing. I just didn’t want to go through that again. That experience inspired a major Oprah moment, my very own “aha.” I realized that even with all those rejections, I wasn’t defeated. I still believed in the book—both my books. I didn’t need anyone to champion my work; I needed to be my own champion. Meanwhile, I had been hearing a lot about self-publishing and was amazed by how e-book sellers like Amazon and Barnes and Noble were making it easier than ever for people like me to sell their work independently, often to great success. Some authors were actually making a living doing it. So I did not pitch my book to anyone. I decided to go it alone. I have never regretted my decision to self-publish. It has been a fun, exhilarating ride. I have total creative freedom on the production of the book, from choosing the title, cover, typeface, and page layout, which many authors do not. I do not have to follow deadlines others have imposed on me; I have worked entirely at my own pace and on my own schedule (for instance, I recently pushed back my launch date by six weeks because I just wasn’t ready). I get to work with pros—a website designer, a video producer, a marketing expert—whom I have chosen myself, not ones who have been assigned to me. The only thing I can’t control is the price of the book, which is determined in large part by the page count. Plus, from what I understand of the traditional system, the majority of authors have to do most of their own publicity anyway, without much of a budget from their publishers, or even any budget at all. And that is exactly what I am doing. The best part is that I am not sitting on the sidelines of my own career, letting others lead it. I often take the advice of other authors and publishing experts but am also free to go my own way, which honestly is what I do most of the time. It is my gut that leads me. This is an empowering thing. 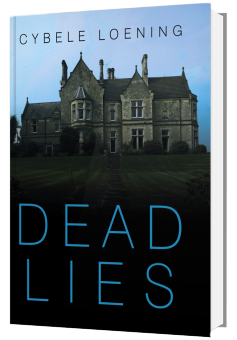 Dead Lies just launched, and my reviews have been extremely positive so far. I have already begun writing my next book, the second in the series, and have plans to get hopefully get Abigail’s Kiss out there too. Maybe I’ll self-publish again, maybe I’ll end up with a contract. Who knows? Either way, I feel like a pioneer on the new frontier. I can’t wait to see what happens next. When was the last time you went it alone on something? Why did you decide to go solo? Do you think self-publishing is the best way for people to go it alone creatively? Great website. Thanks for the inspiring articles. I reside in Pine Plains, NY and the name of the story I am working on is called Cheap land.